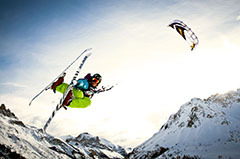 Snow kiting is one of the fastest growing and most addictive winter sports. You can jump farther and higher than you ever imagined possible and land smoothly! The backcountry potential is endless, covering miles over untracked powder in no time at all. The sensation of going up hill with the kite is wild and opens up even more terrain. Add speed to the equation and this sport has got it all! 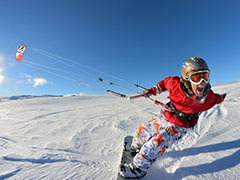 All you need is snow and a power kite and you can turn a cold winter's day into a blistering, adrenaline soaked experience. 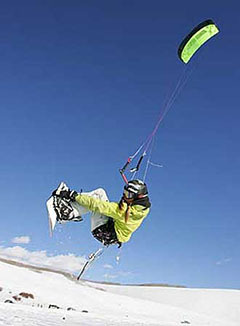 Speeds of over 50 mph have been recorded as snow kite riders blast themselves along with just the power of the wind. The 'Big air' jumps that boarders and skiers are pulling under the power and security of power kites are simply breath taking. Using the natural power of the wind, a snow kite and a pair of skis can also take you deep in to the untouched powder, that only heli-skiers and ski tourers could reach before. However, even a flat field can be a playground with a kite and snow! 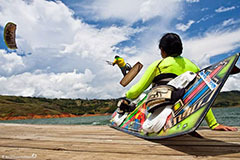 Wind power is one of life's few free rides and already snow kiting enthusiasts have achieved incredible things. From a ground breaking unsupported journey to the North Pole and back to huge kite powered adventures through Alaska, the world of winter sports is embracing this new fantastic new sport. The potential is simply limitless. A picture is worth a thousand words. So these two videos say it all. You've got to see this to imagine it.